In Las Vegas? Are you craving casual but delicious French food with a cool patio? Mon Ami Gabi at Paris Hotel on the Las Vegas Strip is the place to go. I would have never visited Mon Ami Gabi had it not been for my friend that raved about the place for its food and relaxed environment. He told me that Mon Ami Gabi was different and that it was not like the other pretentious and overpriced restaurants found on the Las Vegas Strip. I’m glad I believed him. 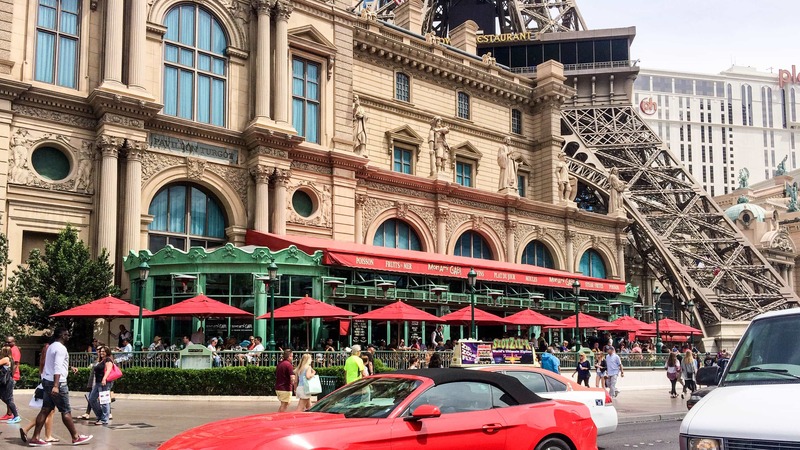 If you have walked by the Paris Las Vegas Hotel, then you have passed by Mon Ami Gabi. I know I have walked by here many times without ever stepping into the restaurant. The patio out front, with its green exterior and bright red awnings, is hard to miss. The restaurant is located next to one of the four legs of the replica Eiffel Tower. Given its location, Mon Ami Gabi is quite popular with foodies, locals, and tourists. On the weekends, the place can get busy. Fortunately, reservations are accepted but only the for inside seating. The outdoor patio seating is first come, first serve. The wait for the patio on my visit on a Saturday around noon was about 30 to 45 minutes. Since you are on the world famous Las Vegas Strip, you can easily find plenty of things to do to waste time until your table is ready. As I walked into the restaurant for the first time, I noticed a rather dark and intimate bar area. A little worried that I was underdressed, I continued and emerged into a rather large and boisterous dining area with towering ceilings and ample natural lighting. The ambiance can much-needed as casual but upscale. You will find white table clothes but without the attitude. When I visited during the day, things were slightly more relaxed. You will find all sorts of people enjoying a nice meal from the well dressed in suits, to families with kids making a mess, to tourists enjoying drinks in shorts and a t-shirt on the patio. At night, though still casual, I would assume people would dress slightly more classy than during the day. The Mon Ami Gabi Las Vegas lunch menu was separated into sections of hors d’oeuvre (appetizers), fruits de mer (seafood dishes), entrées, les salades (salads), steak frites (steaks), crêpes and quiche, and burgers and sandwiches. There was also a limited brunch menu served only on weekends. The menu included eggs benedict, fruit salad, french toast, fruit bouquet, corned beef and hash, muffins, and coffee. The meal was started off with the Petite Salad Maison ($9.95), a fancy name for a simple dinner salad. For the price, I was slightly disappointed with how small the salad was. Without worrying about the portion size to cost, the salad was extremely fresh and simple. Mixed greens topped with red and yellow cherry tomatoes, sliced onions, celery, and cucumbers. The best part of the salad was the delicious, sweet, and tangy lemon-dijon vinaigrette. I love corned beef. With a limited brunch menu, I was delighted to see Corned Beef Hash and Eggs ($12.95). The dish featured two over easy eggs on top of a pile of corned beef topped with fresh herbs, a small grilled potato, bread, and a side of hash browns. The components of the dish were simple yet delicious without being too fancy. The eggs, slightly runny when I cut into them, were cooked exactly how I ordered. The corned beef was extremely tender, smoky, and slightly salty. Just how corned beef should be. The bread was warm, thick, and basic. Strangely, there was also one small piece of a grilled potato on the plate. Though delicious, I wish they included a few more pieces. Potatoes aren’t that expensive, right? On a separate plate to the side was a small serving of hash browns. The top layer of these square-shaped potatoes was crispy and brown. Just below was a soft layer of warm shredded potatoes. For some extra added flavor and heat, ask for a bottle of Tabasco hot sauce. I won’t give away the surprise, but wait until you see the size of the bottle of Tabasco. To be honest, I’m not a fan of anything made with liver, especially chicken liver. For unknown reasons, I decided to give liver one more try. Maybe I thought Mon Ami Gabi could prepare the dish better than other places. Taking a chance, I ordered the Chicken Liver Mousse Pâté ($12.95) with a Burgundy red wine mustard, olives, and cornichons, a fancy name (that I had to Google) for pickles. The first thing that caught my attention was the portion size. I was kind of surprised with how much pâté was on the dish. Usually, I love huge portion sizes, but with the liver, I was a little less than thrilled. When I think of liver, I think of gritty textures and strong, earthy flavors. The liver flavor of this pâté was quite mellow making it much more enjoyable. The texture of the pâté was incredibly smooth, rich, and creamy. Make sure you spread some of it on the crispy slices of toast, or better yet, on the fresh and warm baguettes that are brought to the table. For a little bit of sweetness and heat, mix the pâté with the spicy Burgundy red wine mustard. For a much-needed change of texture, sample the small assortment of crunchy pickles, pearl onions, and olives to the side. The saltiness and crunch of the vegetables worked well by complementing the flavors of the rich and smooth pâté. In the end, I actually enjoyed the chicken liver mousse pâté. Am I a fan of chicken liver now? Nope. But I would order it at Mon Ami Gabi again and recommend you do the same. Next up was the Seafood Crêpe ($16.95) with scallops, shrimp, peas, and a cream sauce. The presentation was fantastic and colorful. The savory crêpe in a creme sauce was topped with two seared scallops, three perfectly cooked shrimps, cabbage, and peas. The crêpe, though savory, soft, and creamy, was forgettable as all I wanted to put in my mouth were the scallops and shrimp. The scallops were perfectly salty and seared beautifully. I just wish that there were more scallops on the place. The shrimp, though basic, were large and cooked correctly. I would order the dish again just for the scallops and shrimp. Though basic, the cream sauce was rich, light, and creamy which complemented the seafood quite well. On top was a small cabbage salad which added a crunchy component and texture to the dish. Service at Mon Ami Gabi was friendly, prompt, and everything arrived correctly. The servers were around when they were needed and knew when to back off when you just wanted to enjoy your meal. You can tell that the servers here have been trained very well. Drinks were also promptly refilled without asking which was a sign of great service.